Dave and Jr. Bullis with Stephanie and Christer Still. Newport, RI, …The Newport International Polo Series is pleased to announce the beneficiary of its 9th annual International Polo Ball on Friday, July 31st - the Newport Performing Arts Center (NPAC), a nonprofit entity currently restoring the Newport Opera House to serve the community as its future live theatre and performing arts venue. “We are committed to supporting this vital civic project, which will boost the local economy with new construction and upscale tourism revenue, as well as elevate the cultural life of our community,” states Dan Keating, President and Founder of the Newport International Polo Series. 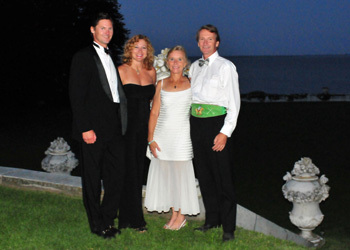 The annual black tie charity gala is a social highlight of Newport’s summer season. Themed Taj Ma Ball, with the Royal Indian Polo Team as guests of honor, the gala will be will be held on Friday, July 31st at Rosecliff, one of Newport's premier Gilded Age mansions on the famed Bellevue Avenue. The evening will include cocktails, a gourmet dining experience prepared by one of Newport's finest gourmet caterers, dancing the night away, and a live and silent auction with fabulous items on which to bid. The popular summer soiree, now in its ninth year, attracts locals, seasonal residents, enthusiasts and polo players from the US and abroad for a weekend of fun in the glamorous seaside resort. Gala Dinner Tickets: $175 (Patron Tables of 10 also available.) include cocktails, dinner, & dancing from 7:00pm-midnight. Dinner seating is limited. Cocktail tickets are also available for $75 for dessert, cocktails & dancing from 9:30-midnight. The restoration of the historic Newport Opera House (Newport Performing Arts Center)will return the former opera house, vaudeville stage and movie palace to its position as a glorious centerpiece of downtown Newport. The mission of the restored Opera House, located in historic Washington Square, is to provide the Greater Newport Area with a unique sustainable community asset that will be a lively center for culture, the arts, education and civic interaction while also providing positive economic impact and contributing to the well being of the city and the region. Washington Square is the virtual heart of historic Newport and the restored Opera House will highlight its central place in the life of the city. For more information on the project, visit www.operahousenewport.org. Alison Vareika, Chairman of NPAC explains, "Restoring the Opera House Theater back to its original 1867 glory as Newport's central Performing Arts Center, could be a real "game-changer" for Newport. The 650 seat theater will present a year round program of dynamic Performing Arts - attracting professional road shows featuring music, international dance, opera, ballet, theater, musicals, comedy, specialty films, family programs and so much more to delight audiences who will make Newport their new destination for dynamic, quality theater. This project is about more than just restoring Newport's historic Opera House. It is about infusing Newport's economy with the kind of financial support and excitement that a downtown performing center can generate by providing a permanent state-of- the-art venue for our existing music and cultural festivals as well as attracting a host of new shows, performers, performances year-round for audiences to enliven the life and economy of Newport for many years to come. Imagine the excitement that live theater could generate in this town! Along with the excitement of Polo, one more great reason to come spend time in Newport for residents and visitors alike." Festivities continue the following day, Sat., Aug. 1st with a polo match between USA and India in the Newport International Polo Series at 5pm on the polo grounds of Glen Farm on the outskirts of Newport, located at 715 East Main Road (aka Route 138) in Portsmouth, RI. The match will conclude with an award ceremony and an authentic New England lobsterbake. Tickets to Saturday’s polo match are available at the entry gates to the polo grounds, which open 2 hours prior to the start of the match. $10/adult General Admission; $15/Box Seating. Lobsterbake reservations must be secured in advance by calling (401) 847-7090 by July 28th. And for polo players, USPA members are invited to participate in club chukkers on Sun., Aug. 2nd as the guests of the Newport Polo Club. Pony leasing can be arranged through Ted Torrey (401) 662-0781. The Newport International Polo Series is in the midst of its 18th season, offering polo matches every Saturday afternoon in June through September on the polo grounds of Glen Farm in Portsmouth. This year the Polo Series features international teams including Chile, Scotland, Ireland, India, Jamaica, England, South Africa and Hungary making its debut appearance. Proud sponsors of the Newport International Polo Series include the Carnegie Abbey Club, WCRB Classical Radio, NBC Channel 10, the Newport Daily News, Pearls Boutique Hotels, Barton and Gray Mariners Club, The Mooring Seafood Restaurant & Bar, Lufthansa, O2 Global Chauffeured Services, Northwestern Mutual Financial Network, Udderly Smooth/CVS and Bose, as well as promotional partners including The Preservation Society of Newport, Bird’s Eye View Helicopter Tours, America's Cup Charters, the Newport Music Festival, the International Tennis Hall of Fame, Eastern Mountain Sports of Middletown and Newport County Visitor & Convention Bureau. "Without their help the Series would not be as extensive as it is,” explained Dan Keating, Polo Series founder. With annual kudos such as Yankee Magazine's "Editor's Pick" for Best Reason to Visit New England, and Rhode Island Monthly Magazine's "Reader's Choice" as Best Evening With the Kids, the Polo Series strives to provide quality entertainment and be an active corporate citizen. For more information, visit www.newportinternationalpolo.com or call 401-847-7090.